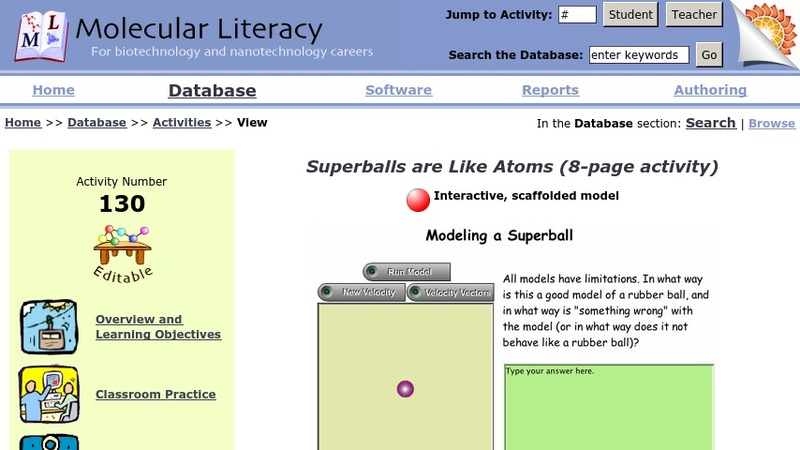 Using a computer model of a bouncing ball, students are introduced to the idea of computer modeling, its limitations, and its advantages. They can experiment with the elasticity of the ball to model balls with different "bounciness," ultimately ending with the understanding that there could be a super-superball, which never loses any of its "bounce" (or kinetic energy). This kind of behavior is very similar to that of atoms, so the model of a superball can be set in such a way as to model the behavior of a single atom. Students will be able to: Using a computer model, demonstrate the necessary conditions for having an atom/ball not convert any kinetic energy to other forms; predict the behavior of an atom with 100% elasticity that is set in motion; investigate two characteristics that affect the kinetic energy of an object; describe how the motion and mass of an atom correlates with a graph of its kinetic energy; describe two different kinds of modeling, one which is an idea or theory, and one which is something that acts out the idea or theory.